I don't remember the first time I heard someone refer to a particular time I was in as just a season. Perhaps it was when I was single. Or maybe it was during a particularly difficult time. Whenever it was, I really grabbed onto it. It was such a wonderful thought, that whatever place I was in at that time was only a season... temporary, fleeting, here today- gone tomorrow. 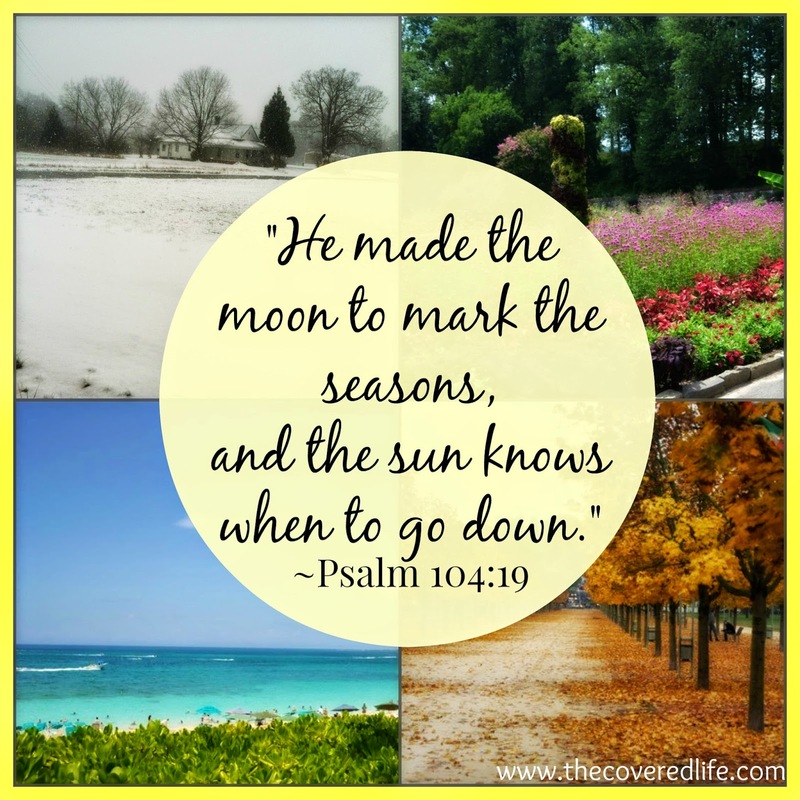 The Bible tells us in Psalm 104:19 that God made the moon to mark the seasons and the sun to know when to go down. This may not be quite the verse you were expecting in this "this too shall pass" type post about seasons, but stay with me... What I love about this verse is first, it's view of how very BIG our God is- He is in control! He made the moon and the sun and He gave them the ability to function- knowing when to rise and go down. Second, I love this thought of time passing, a new season is coming and a new day as well... which leads me to think of one of my very favorite verses, Lamentations 3:22-23, "The steadfast love of the Lord never ceases; his mercies never come to an end; they are NEW EVERY MORNING; great is your faithfulness." Each new day is accompanied with new mercies from God. He is forever faithful, every minute, every hour, every day, every season. He is in control of it all! So if you are going through a very difficult time and just don't know how much more you can handle right now- remember it's just for a season. Continue to press into Jesus and the Word and remember that God will never leave us or forsake us- He is faithful! And for those of you who are not going through a tough time at this particular moment, but are in the midst of parenthood to a teenager, middle-schooler (bless you), a new born, or a toddler (like I am) remember that you too are just in a season. That may give you comfort, or drive you to tears! But the reason I say it, is because not only can we focus on time marching on as a reason to hope, but we should also see it as a reason to live. We need to cherish each moment- the good and the bad. We need to learn from both and move forward with hope in Jesus. We don't need to just be passing through, sitting back waiting until finally *whew* this season has passed! No, we need to be active and doing and living. We don't need to wallow in the hurt, guilt, shame, pain- yes there is a time for them. (Here comes the scripture, you probably thought was coming earlier.) Ecclesiastes 3:1 tells us, "For everything there is a season, and a time for every matter under heaven." There is a time to weep and a time to mourn, but there are also times to laugh and dance. Don't get so caught up in the season you are in that you stop progressing. Keep moving. Keep going. A new season is coming. And don't be so prideful, that you begin to take for granted this wonderful season you are having and forget the One who blessed you. Keep serving. Keep giving. A new season is coming. Whatever season you find yourself in at this very moment- just remember it's only for a season.